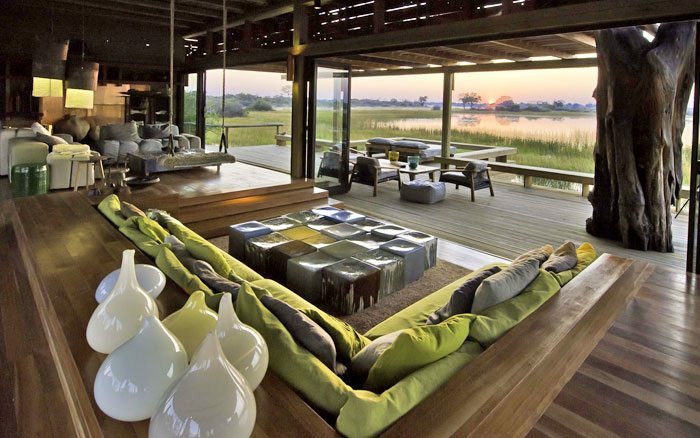 Vumbura Plains consists of 2 small camps (north and south), each with 7 huge rooms spaced well apart and overlooking the vast Okavango floodplains. 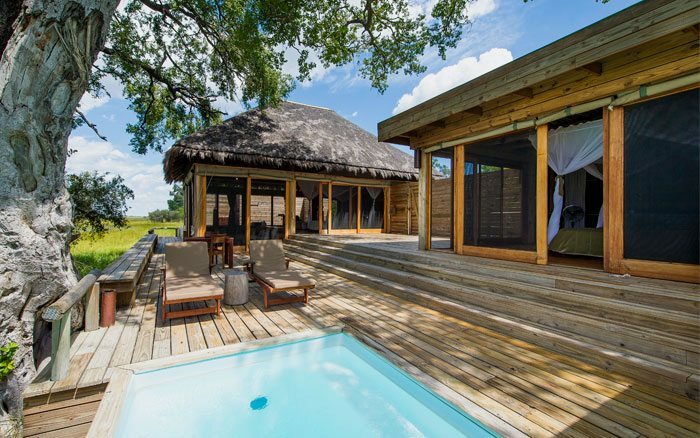 Vumbura Plains consists of 2 small camps (north and south), each with 7 huge rooms spaced well apart and overlooking the vast Okavango floodplains. 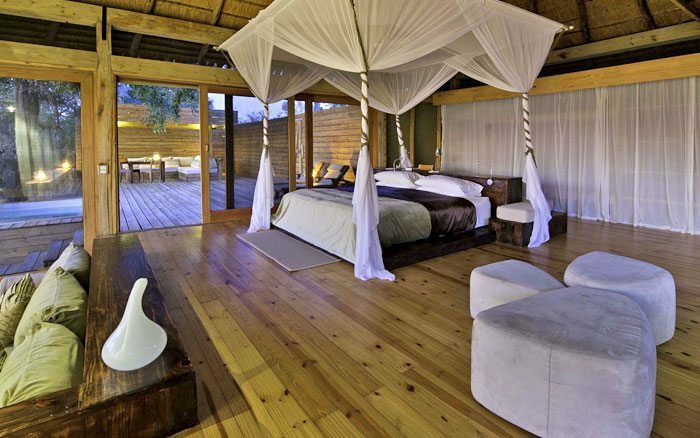 This is high luxury in a remote bush setting, with excellent year-round game viewing. 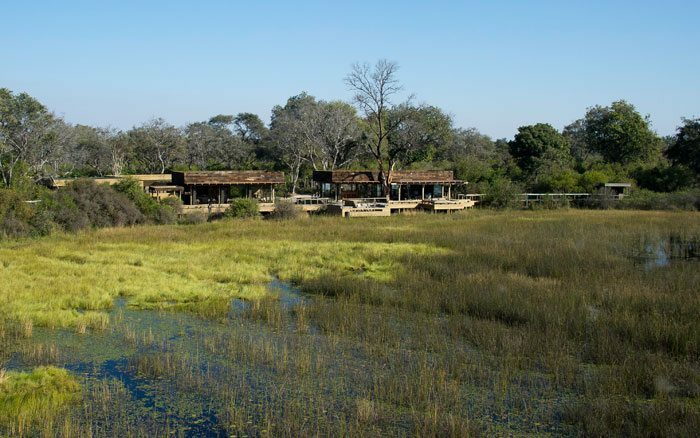 It’s a very high priced camp, but it delivers great service and quality, and the game viewing here rarely disappoints. There is great feeling of space throughout the camp. The large deck has comfy seating around 3 sides arranged around the firepit. You can sit here at any time of day and gaze out over the plains and waterways, watching for wildlife and enjoying the company of other guests. 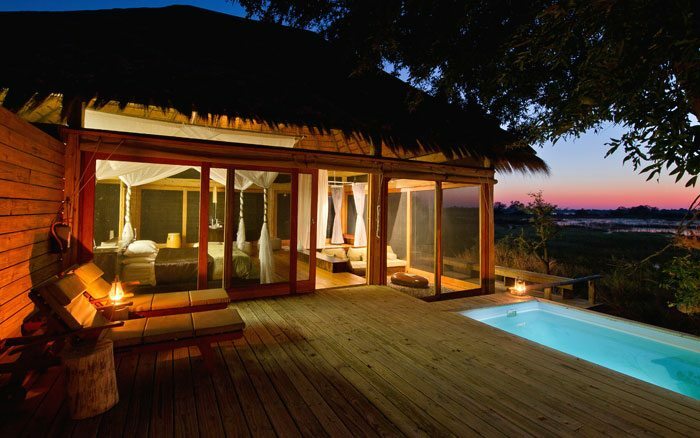 If you’re lucky a herd of elephants may stroll by, bringing the safari to your doorstep! When it’s too hot to sit in the sun you can retreat to the comparative cool of the shaded lounge whose open sides still allow you to enjoy the panoramic views. There’s an indoor dining area, though many meals are eaten al fresco. Guest rooms continue the theme of space, with an open-plan bedroom and lounge, large bathroom and outside deck. They’re tucked away in the tree line, so you won’t be overlooked. Everything is high quality, from the polished wooden floor to walls made up of sliding gauze doors, the fine bed linen to the colourful textiles. The lounge area is to the front of the bed, set on a lower level, and consists of a corner sofa and a nest of tables. A fan keeps the room cool. The bathroom is sleek and contemporary in style, with a flush toilet, hand basins and shower, plus an outdoor shower. The deck has a sala and a plunge pool. You’ll have a choice of game drives by day and night, mokoro excursions and guided walks. Motorboat rides are offered when water levels allow. The wildlife is very varied here and includes elephant, buffalo, wildebeest, zebra and antelope, with lion, leopard, cheetah and wild dog among the predators. Birdlife is profuse, too. 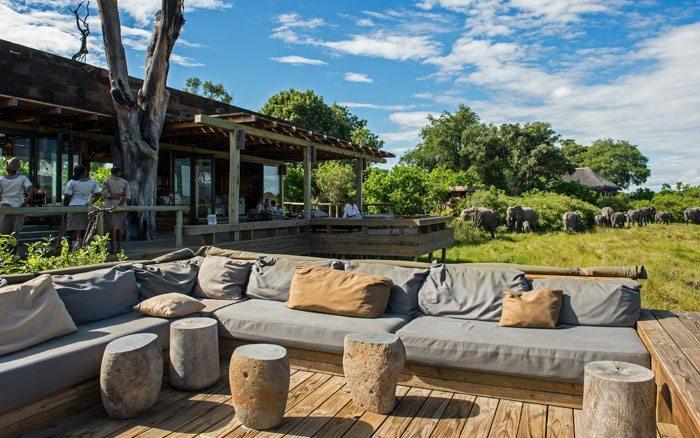 All in all Vumbura Plains is a camp which not only manages to please those looking for all possible comforts in a wilderness setting, but also those who want a hard-to-be-beaten wildlife experience. Vumbura Plains has a sister camp called Little Vumbura which is in the same reserve and is great quality, but is not quite so luxurious. Children aged 12 years and over are welcome, but from 12 to 16yrs they must share a tent with their parents. 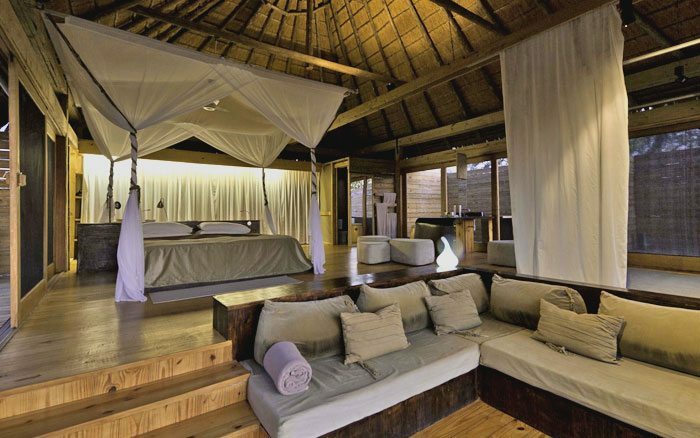 The 5 luxurious suites are reached by wooden walkways and offer secluded accommodation with indoor and outdoor seating, well-equipped bathroom and large private deck.